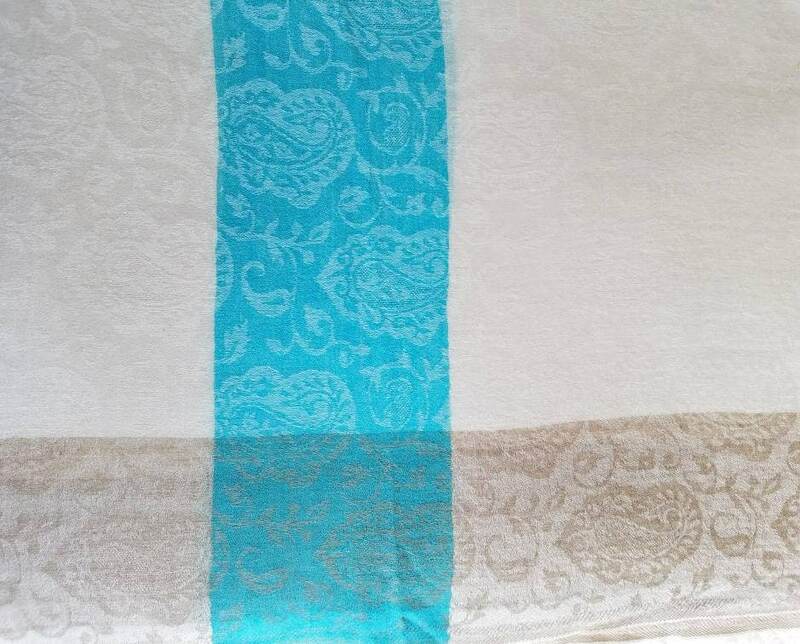 Tuck this extremely light weight turqouise blue and cream colored pashmina shawl into your purse, and forget about it. Pull it out whenever needed - a restaurant, concert hall, airplane. It folds down to the size of an envelope! Never be cold again! Pashmina is the finest type of cashmere wool. 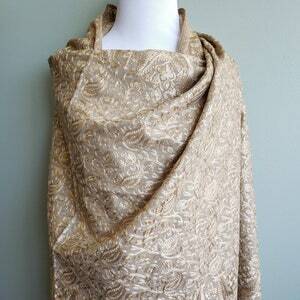 The name comes from the Persian and means "soft gold" in Kashmiri. The wool comes from the soft downy undercoat of the Changthangi goats, which protects the goats and keeps them warm during the harsh cold winters of the Himalayan mountains, often -40 C. The best wool comes from goats wintering above 14,000 ft. In the spring the goats naturally shed their undercoat. The Changpa people of the Himalayas collect the undercoat by combing the goat. 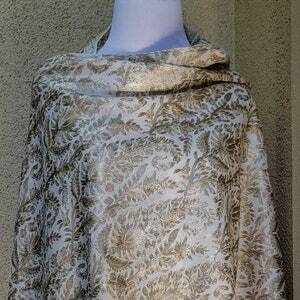 Pashmina shawls have been worn by royalty in the region for centuries. 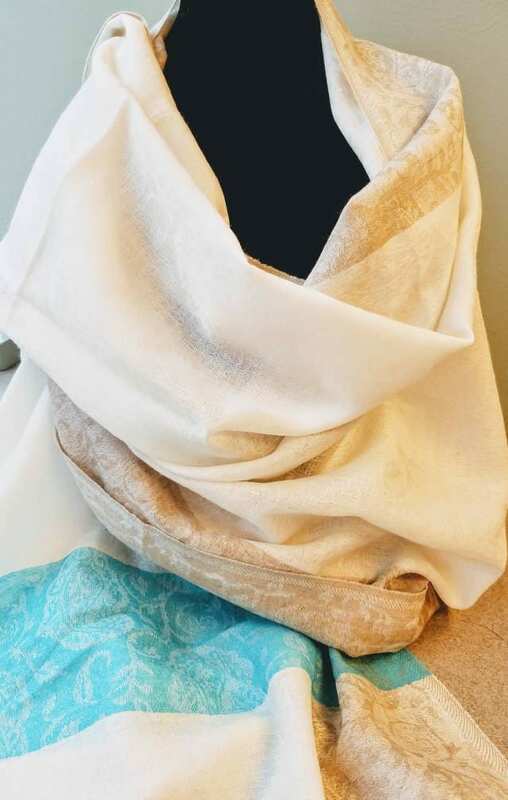 Pashminas are known for their softness and warmth. 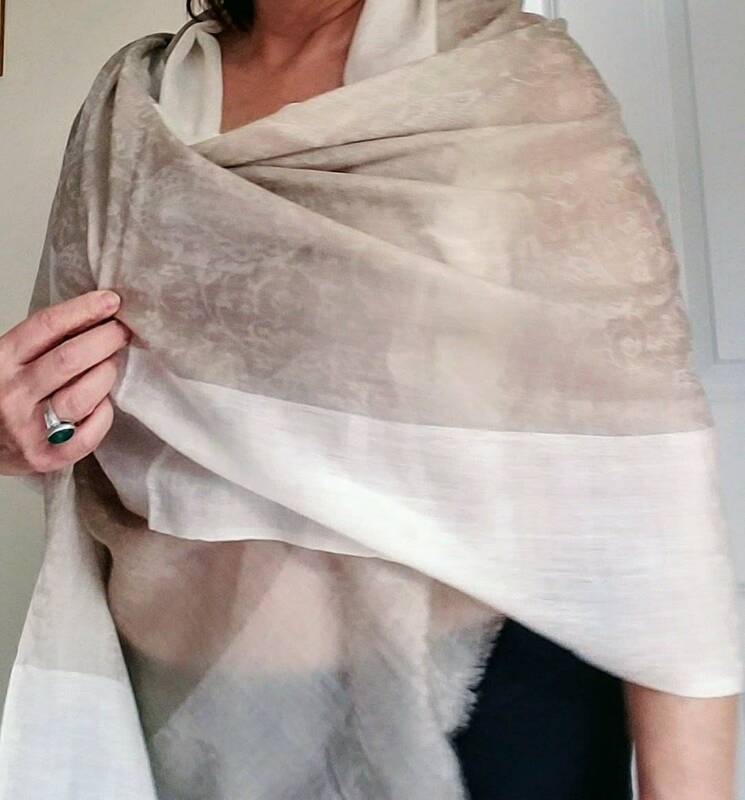 Pure pashmina is a rather gauzy open weave as the fiber does not tolerate high tension. 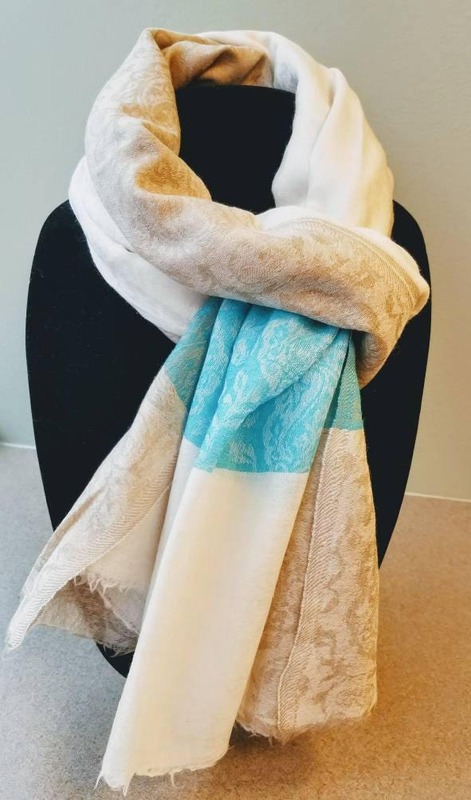 The price of pashmina is due to the rarity of the pashmina wool, as the goat is very rare, and the expert craftsmanship that goes into each shawl. All steps, from combing the goat, spinning the wool, to weaving and finishing, must be done by hand, due to the fineness of the pashmina fiber. 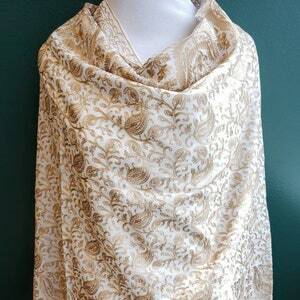 It takes approximately 180 hours to produce a single shawl. Soft colors.......soft feel......oh, so soft......Thin, almost sheer, but very warm. Appears delicate, but it is very strong. Drapes beautifully!!! The colors just glow! Cream background. 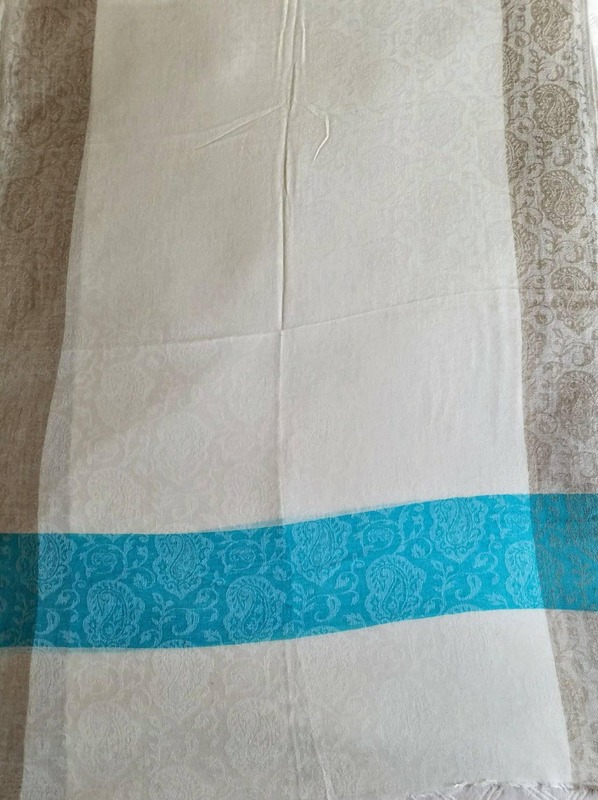 Soft taupe colored borders lengthwise top and bottom with turquoise stripe crosswise, 6 inches from either end. 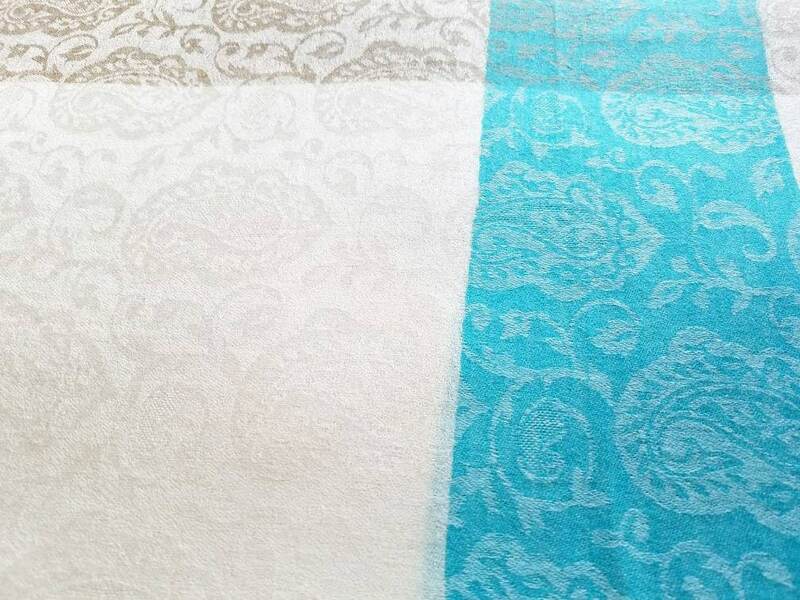 Very subtle woven paisley pattern throughout, which is more pronounced in bright light. Raw edge end. Generous size: 80 inches long, which is 6 ft 8 inches; 30 inches wide, which is 2 ft 6 in. Taupe border measures 4.25 in wide. Turquoise stripe measures 4.25 in wide. Also doubles as a wonderful scarf! 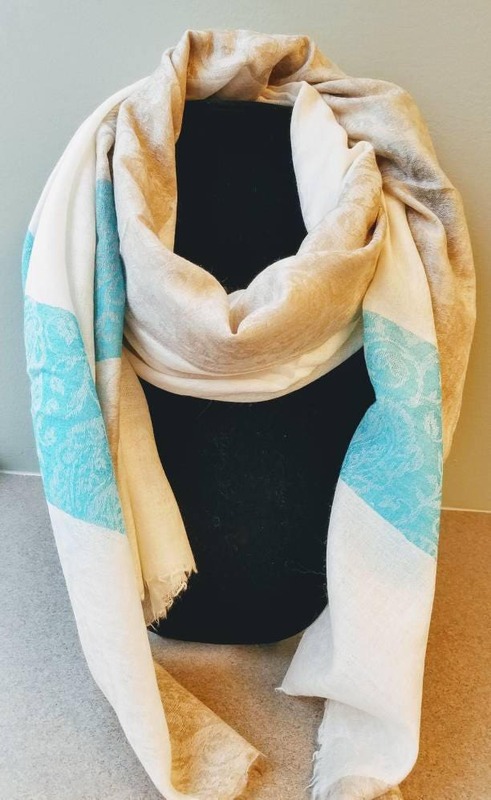 Cozy and soft on your neck! Be fashionable while you brave the winds and bad weather. 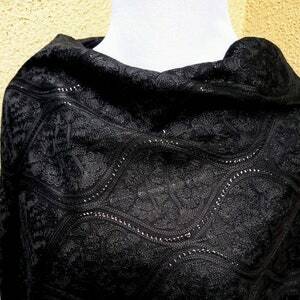 You will receive so many compliments wearing this shawl!